Have you finally grown tired of running to the local gas station on the weekend and waiting in a long line just to get your propane tank filled so you can finish grilling those steaks for dinner? If you have you are not alone and you are feeling the frustration of owning a grill that runs on propane. Now imagine if your BBQ was hooked up to an unlimited gas supply and no matter when, your grill is ready to fire up and cook whatever tasty meal you have whipped up. This is possible with the installation of an outdoor natural gas line for your BBQ. By installing an outdoor gas line for your BBQ you are ensuring that you will never have to make that weekend evening run for propane again. 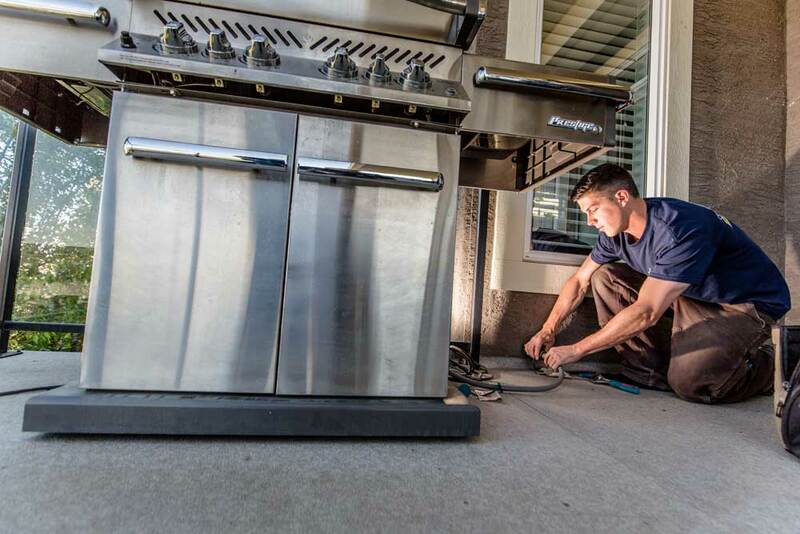 Your BBQ will be hooked up to a gas source that is always ready and waiting. You will also be saving yourself money by no longer paying for propane and instead paying for the less expensive natural gas that runs to your home. The convenience and cost saving advantages of installing an outdoor gas line for your BBQ is why so many homeowners in Calgary are making the change. The licensed and experienced Calgary gas fitters at Lone Star Plumbing and Heating are experts in installing outdoor gas lines. Our gas fitters have handled countless outdoor gas line installations for BBQ’s, patio heaters, fire tables or outdoor gas fire pits. If you have decided it is finally time to install a gas line for your outdoor lifestyle then the experts at Lone Star can install the gas line you need. Let our Calgary gas fitters install a gas line that finally gives you the convenient grilling, heat or ambiance you have been waiting for.